We have already reviewed the basics of Marketing Automation together. Now, we will focus on the ultimate goal: setting up workflows. A Marketing Automation workflow is communication experience that you design for your contacts to move through. 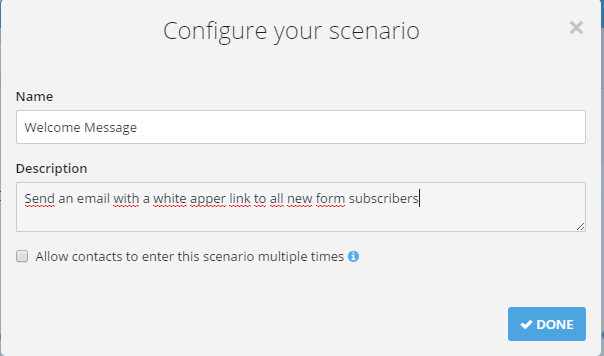 Entry point: this is a condition to filter your contacts and allow them to begin the workflow. You can specify several different entry points, e.g. when a form is submitted or a specific page is visited. Action, e.g. when an email or SMS is sent. The "actions" are not necessarily an "exit point" from the workflow; they can take place throughout the workflow and at the end. The workflow can also contain "conditions" that are effectively filters, e.g. add a filter to only target contacts of a certain age or gender. Start with a pre-made workflow, such as welcome workflow, or one that targets users based on a website page visit, email activity, etc. Learn more about pre-made workflows. Create a custom workflow: start from scratch and create your own workflow. First, let's go to the "Workflows" tab and click on "Create a new workflow". The workflow name and description that you enter here are for information purposes and will not be displayed to your contacts. You will notice that we did not check the option "Allow contacts to enter this workflow multiple times". (If we had checked this option, we would have allowed the same contact to repeat this workflow several times.) In the example created here, a person who subscribed several times using the same sign-up form will only receive the welcome email once. "A contact submits a form": this is the option we will use in our example. We are going to filter the contacts who submitted a form that was created using SendinBlue. "Another event happens": as we saw in the first Marketing Automation tutorial, it is possible to create custom events (for example, for order tracking). To learn more about setting up "custom events", please click here. Let's continue with our example and select submitting a form as our entry point. The drop-down list contains all the forms that we created using our SendinBlue account. As you can see, we can add multiple start points. Next, you can add the actions or steps you would like your contacts to experience within the workflow. You can also add the exit criteria or add intermediate steps by clicking on the "+" button. Send an email or SMS: If you choose to send an email, you need to have previously created the template using your SendinBlue account. 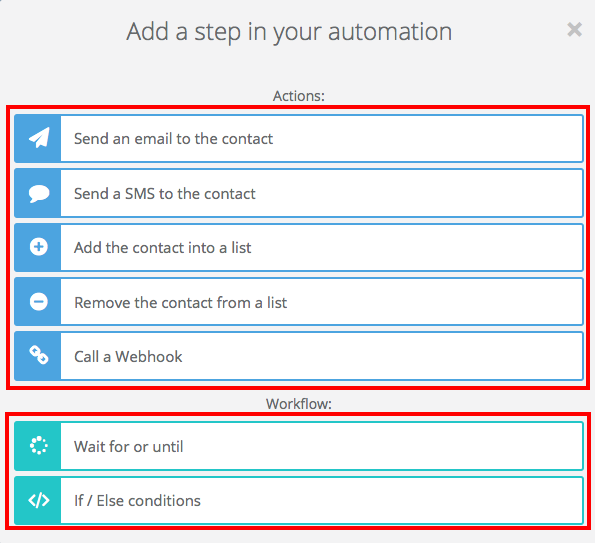 If you choose to send an SMS, you create the message while building a workflow. Add/remove a contact: from a SendinBlue list, e.g. add the people who asked to download a white paper to a specific list. Call a webhook: This allows you to retrieve data from your database in real time. Time dimension: This requires the contact in the workflow to wait for a specific period of time or until a custom event occurs before moving to the next step of the workflow. Conditional dimension: The step is based on whether a certain condition is true or false. Conditions can relate to a contact's attribute or a custom event. Once you have created your workflow, you can activate it by editing the workflow and selecting "On". If you go back to the Workflows tab, you can see the metrics for your workflow(s). The figure in box #1 shows the number of active contacts in the workflow. Box #2 shows the number of contacts who have completed the workflow. Box #3 contains the number of contacts who have entered the workflow after it was activated. (Box 1 + Box 2 = Box 3) You have now completed your first workflow! Welcome to the world of efficiency!